Healthy skin is important for looking and feeling great. The first step to achieve this is to clear up acne. Make your own natural face wash, and then try these DIY home tips for scarring. Other skin issues can be harder to eliminate, however. We're talking warts, skin tags, age spots, moles and blackheads. Fortunately, you can help remedy some of them using the natural methods below. 1. Oregano oil. WikiHow recommends oregano oil, a powerful antiseptic and antispasmodic, to help the skin tag dry up. For best results, apply five or six drops of oregano oil to the tag three times a day for about a month. 2. Castor oil and baking soda. Mix the two ingredients to make a thick paste. Dip a cotton swab in the paste and dab it on the skin tag. WikiHow says this is among the best home remedies for skin tags. 3. Lemon juice. According to WikiHow, lemon juice is not only acidic, but also antiseptic. 4. Onion and apple cider vinegar. Organic Facts suggests applying a mixture of equal parts onion juice and apple cider vinegar directly to the age spot. To make the onion juice, blend an onion, and then drain using a strainer. 5. Horseradish and milk. Soak raw horseradish in a bowl of milk for 20- 30 minutes. Next, Organic Facts says to apply the treated milk to the age spots. The antioxidants and volatile compounds can help the age spots fade and eventually disappear. 6. Buttermilk and tomato. Organic Facts says the potent acids in this odd combination can help fade age spots. 8. Essential-oil bath. 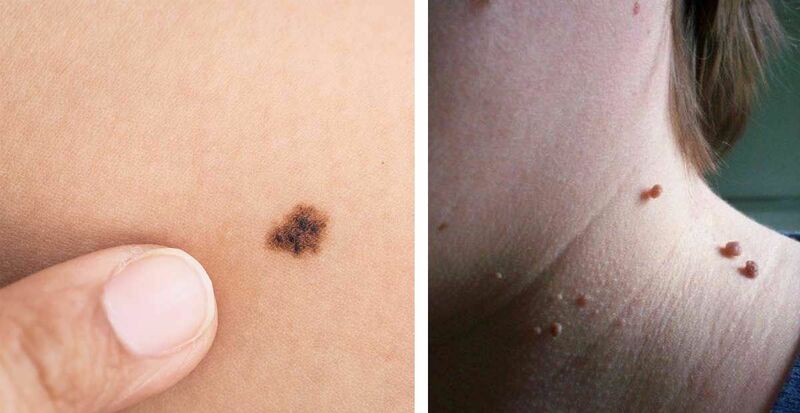 For moles on multiple body areas, Beyond Disease recommends soaking in a hot bath treated with 1 cup baking soda, 1 cup sea salt, 6 drops lavender essential oil and 3 drops frankincense oil. 10. Banana peel. This one entails a little more effort than the vinegar, but according to Everyday Roots, the banana peel contains a proteolytic enzyme that eats away at warts. Use a spoon to scrape away the soft, white substance on the inside of the peel, and apply it to your wart. Cover the wart with an adhesive bandage. Repeat daily. 11. Pineapple juice. This works on the same theory as the above two tips but with a tropical twist. Soaking a wart in pineapple juice exposes it to acids that work to break it down. 12. Baking soda. As an antiseptic, baking soda cleans your skin, helps neutralize pH levels, and encourages skin to produce less oil, thereby helping the fight against blackheads, according to Natural Living Ideas. It also exfoliates dead skin cells, leaving your skin soft and smooth. Add a little water to form a paste and apply it to your blackheads. Leave it for about 10 minutes, then rinse with warm water. 13. Oatmeal. Natural Living Ideas says this delicious breakfast food also makes a great cleanser, working to loosen debris stuck in your pores and help eliminate blackheads. Cook the oatmeal as usual, allow it to cool, and then apply it to your face. Leave it on for 10 to 20 minutes. 14. Lemon juice. Is there anything lemon juice can't do? Natural Living Ideas explains that it contains alpha-hydroxy acid (AHA) citric acid, which helps remove dead skin and unclog pores. Rich in vitamin C, lemon juice also stimulates collagen production to improve overall skin health. After cleansing as per your normal routine, use a cotton ball to dab lemon juice onto blackheads. Leave it on overnight, or rinse after 10 minutes. The juice will sting if you have broken skin. Always exercise caution when using home remedies, and don't apply any substances high in natural acids to broken skin. Use only when the skin around the blemish is clean and healthy. As with most skin treatments, your results can vary. Likewise, they're not instant fixes, but with daily use, you could see results within a few weeks. Let us know which treatments work for you!